75 Watt 12" @ 16Ω in unique tyre enclosure. Marine-grade plywood baffle. Convertible open or closed back. All threaded bolts. Speaker mounted off centre for acoustic reasons and to prevent roll. 300 Watt, 8ohm12" & tweeter, passive PA box. Guitar speaker cab. 4x12" 300 watts mono / 150 watts per side stereo. H/H U.K. speakers. On castors. 4 x 12" cab with Mesa Black Shadow speakers. 280 watt 8Ω Only used a handful of times! Fantastic condition! 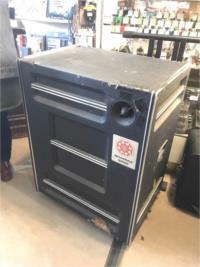 with road case! 1x6" 100 watt 8 ohm extension cabinet for the Lunchbox series. Phase reversal switch. Super portable! 4x12" 180 watts. 4 and/or 8 ohms. Two Celestion G12-60 and two Celestion Black Shadow MC-90 speakers. 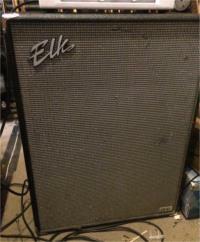 Vintage 1970's Cabinet Made in Japan Loaded with late 1960's Australian Made MSP 12PQ AlNiCo Speakers (15 Watts each). Total handling of 30 Watts at 8 ohm. Open Back. Made in USA 1930s. 10 watts? An old PA speaker box wired up and ready to rock. Sounds great with a low wattage valve amp. Very measured sound and no bad frequencies. Made in Melbourne, 4x12" Quad box. 300 watts, 8ohms. Contains Lorantz speakers (model unknown but each is 16 ohms). 4x12 Made in Melbourne early 90s with Lorantz speakers, 300W 16 ohms. with castors and cable. Organ Speakers. Made in England 1960s-70s. Leslie rotating speaker-esque. With onboard preamp. Two independent channels. 2 x independent 15" speakers. One channel Rotating horn and rotating drum clean channel! Other channel forward facing tweeter and 15" woofer. Vintage 1970's Made in Australia - Thomastown! 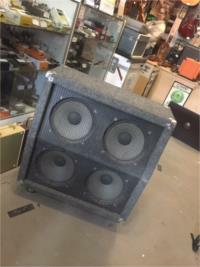 Original Etone Speakers - Approx 100 Watts- 16Ω / Includes Speaker Lead! Made In Mexico "Metal Head" 400 Watt 4X12" @ 4Ω - Celestion G12K-100's - Brutal But Clean Condition! Enter your email address below to get alerts for Speaker cabinets.